Related to PutnamEco's latest post » Get Your Brushes and Rollers Clean. Here is a look at a new product that makes cleaning your brushes even easier. The EasyClean Paintbrush solves the common problem of not being able to completely clean all the bristles of your brush. This is all made possible by allowing you to clean the brush from the inside out. The process could not be any easier. 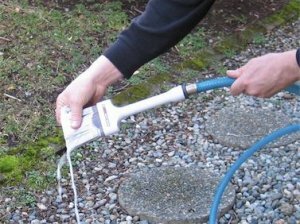 Simply attach the brush via a threaded handle to your garden hose or utility sink, and rinse away any remaining paint. The EasyClean Paintbrush is available in 10 sizes (from 2" to 4" wide) in straight or angled styles from their website. Or you can pick up a 5 pack set or 7 pack set at Amazon.com with free 2 day shipping by signing up for a free trial of Amazon Prime. The best part about the free trial is you can cancel online after your month is over.